Preparing fish is one of the fastest and easiest healthy proteins to enjoy. Once you learn the easy basics of fish cookery, you’ll be ready to taking it up a notch. If you want to take your fish dishes over the top with taste and nutrition, dress them up with superfood salsas and toppings made with other superfoods like fruits, seeds, nuts, and spices. Try these unique ways to celebrate healthy eating and break that boring, plain boring health food rut. Top your baked or pan seared fish with lemon or lime zest plus a few teaspoons of chopped herbs like thyme, basil, or rosemary. Fresh herbs are rich in antibacterial compounds and provide a flavor boost with hardly any calories. A spritz of fresh lemon is also a fine way to top your fish and a great flavor pairing with olive oil, grassfed butter, or coconut oil. 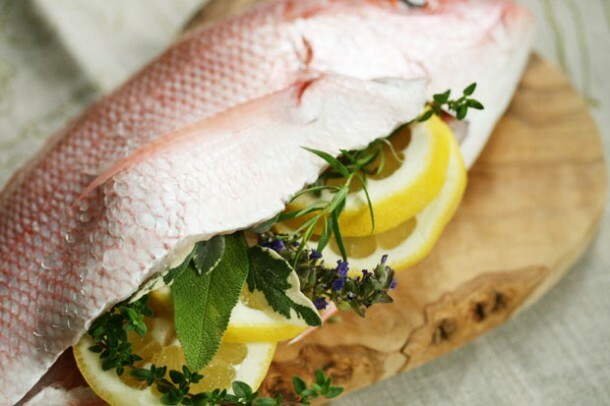 If you’re baking or grilling a whole fish, you can stuff the fish cavity with one sliced lemon and a small handful of herbs that will scent your fish while it cooks. Fruit and fish may seem like a no-no, but some tart fruit like pomegranate arils, blueberries, and goji berries. Combine your berries with minced red onion, cilantro and a little lime and salt for a delightful salsa or make them into a savory sauce by cooking them with soy sauce and a little garlic. 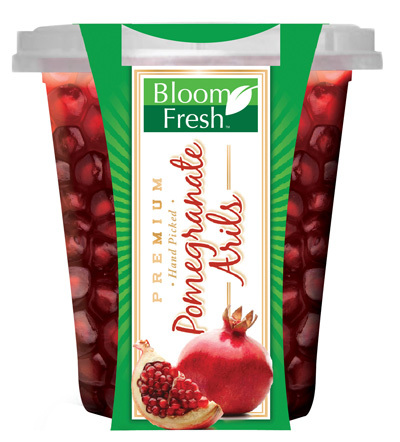 I love the ease of these these Bloom Fresh pomegranate arils that are already peeled and picked for you, ready to serve. Hydrating berries add fiber, vitamin C and antioxidants while they make your meal look drool worthy. 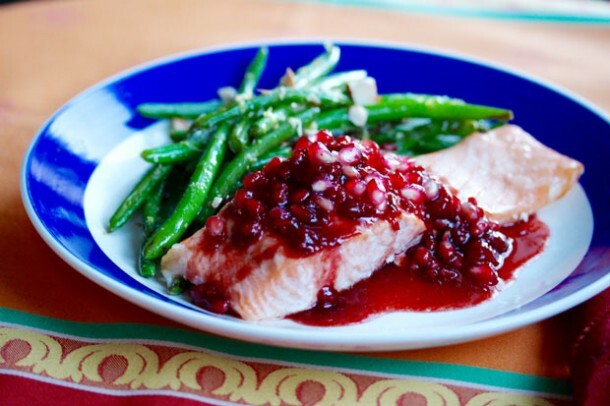 Check out my Pomegranate Soy Salmon with Almond Green Beans below for a festive meal that can freshen up your week day menu or become the new star of your holiday feast. Top you fish before baking with a few teaspoons of mustard or honey mustard and top each filet with a few tablespoons of chopped nuts such as brain beneficial walnuts, lean pistachios, or rich macadamia nuts. Bake in an oven proof dish on the middle rack at 400°F for 10 to 20 minutes depending on the thickness of the filet, 10 for thin filets like sole and 20 for thick salmon filets. 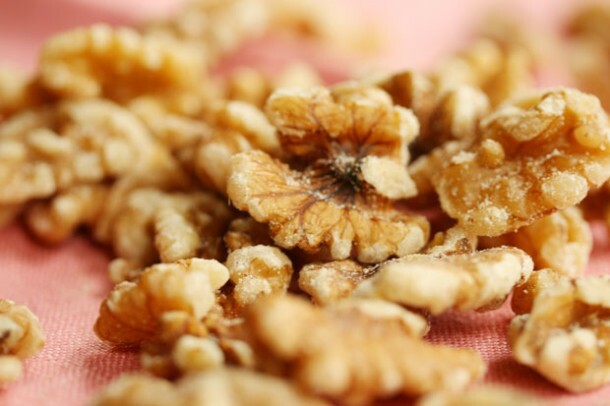 Nuts are rich in manganese and magnesium (great for brain and heart health) as well as antioxidant rich oils. Nuts add a pleasant crunch and rich taste to flaky fish. No one would every dream that this elegant salmon is a simple dish that any newbie can cook in under 20 minutes! Enjoy this heart healthy meal as part of a new holiday tradition or to impress someone who is new to your dinner table. Preheat the oven to 400°F. Place the raspberries, half the pomegranate arils, soy sauce, honey, and half the sesame oil in a small saucepan. Bring to a simmer over medium heat and cook 10 to 15 minutes until a thick sauce forms. Set aside. While the sauce is simmering, prepare the green beans. Warm the remaining half of the sesame oil in a large skillet over medium heat. Add the green beans and cook 5 to 6 minutes, covered, stirring often until they are well brown and tender. Stir in the lemon zest, juice and toss well. Sprinkle with the almonds and set aside. Place the salmon skin side down, in a 7X11 baking dish coated with cooking spray or lined with parchment paper. Bake 10 to 12 minutes, until the salmon flakes when pressed with a fork. Using a spatula scoop the salmon from the skin and transfer it to a plate. Divide the sauce between the four filets and serve immediately with green beans. Are you eating up the tips in this blog? Check more cooking tips for fast weeknight meals. I never would have thought of using pomegranates with my fish. However, it sounds like it a great idea. It would be sweet and a little crunchy without my having to put nuts on the fish. I don’t like nuts all that much. Thanks for the recipe. Now I can make something that I would only expect to find in a restaurant!